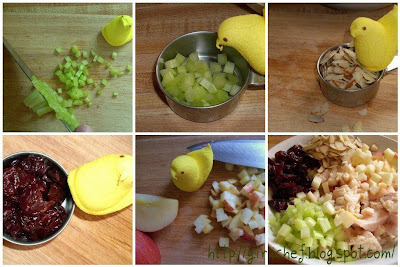 Jennifer from Savoring the Thyme sent another challenge out to foodies recently...make something healthy and somehow incorporate a Peep! I'm gonna have to say, this was a hard one. I could think of lots of different not so healthy things to concoct with a Peep or two, but healthy? That was, until this little yellow Peep hopped over and told me I should make some good old chicken salad. Mr. Peep hopped right onto my cutting board and watched as I chopped some celery and measured it. He then proceeded to level off my almond slices. He tried one of my tried tart cherries and reeled back with a pucker. He also stopped me after dicing up only half of an apple...whoa girlichef, enough of that! Mr. Peep told me to go ahead and put all of the good into a bowl with some diced, cooked chicken and mayonnaise. I did. I proceeded to mix everything together. Mr. Peep added a few good pinches of salt and I cracked in some fresh black pepper. He then hopped away, saying I'm off to round up some more of my Peeps. They must see this salad I've helped to make! 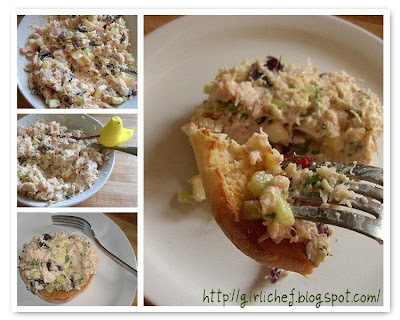 I decided to spoon some of the Chicken Salad with cherry, apple & almonds onto a toasted English muffin half and eat it quickly before Mr. Peep (and his Peeps) returned. As I was eating, I realized how tasty this chicken salad would be folded up into a wrap w/ a mix of Spring Lettuces. Before he came back, I threw a spinach & garden vegetable tortilla over a low flame to heat it up and make it pliable, then added some lettuce and a good-sized scoop of the chicken salad. 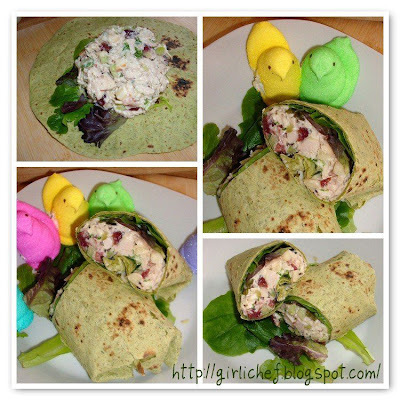 Mr. Peep actually brought back 4 of his Peeps and they all sat around for a bit to marvel in the beauty of this Chicken Salad Wrap. But alas, 3 of them had already eaten...so they hopped away, peeping their regards. Mix everything together, with salt & pepper to taste. Eat as is or make into a sandwich, wrap, etc.